When it comes to diesel, the US has had mix emotions. While a certain generation remembers the clattery, smoky and loud diesels of the 1970s, a newer one will have had a different experience. Diesels have evolved over the decades with Europe’s strong market that has pushed manufacturers to refine them. So is the US ready for diesel? GM seems to think so. Introducing the Cruze Diesel 2.0 TD. The price of the 2014 Cruze diesel sedan starts at $25,695, including the destination charge of $810, and a two years maintenance plan. Chevrolet is officially pulling the covers on the Cruze 2.0 TD today at the Chicago Auto Show. In a bold move to counter the luxury European brands that have re-introduced diesels with success, GM feels it can convince us with its turbo diesel Cruze. My talk with James Bell, Head Of Consumer Affairs for GM has me convinced the Cruze 2.0 TD might the right car to change your mind. Essentially the 2L diesel is a European engine used with Opel and Vauxhall but has been seriously reworked for the US market that will tolerate the clatter as Europeans would. Conversely, these refinements will go back to Europe to further refine diesels there. To exceed the US market expectation, GM has done much work with the underbody and hood to keep the sound down. Technically Speaking. Using a 1998 cm3 diesel motor uses a common-rail direct injection system. The Cruze 2.0 TD puts out 120 KW, that 163 hp at 3800 RPM. Diesels are known for torque and the engine gives a 266 lb-ft as early as 1750 all the way up to 2750 RPM. The unofficial fuel numbers are 32 mpg in city driving, 56 mpg on highway for a combined of 44 mpg. Forgetting The Old Diesel. A newer generation used to various Audi, BMW and Mercedes will understand modern diesels that are cleaner, quieter with less emissions. The challenge for Chevrolet is to show the Cruze 2.0 TD as a new option, as alternative energy vehicles are starting to be seen these days. Chevrolet is targeting key markets where diesel penetration has been strong, such as California, the Northeast and Texas. Later on, the car will be offered nationwide. There are slight visual differences between the TD and the regular versions. James Bell, Head of Consumer Affairs at GM told me: “Chevrolet will show American consumers are in for a real positive surprise after having tried the European equivalent when they test drive a Chevy Cruze 2.0 TD.” The Cruze 2.0 TD will be competitively priced with the regular versions. As fellow Torquenews writer Don Bain; Clean or not diesel is coming to America, diesel is making a strong come back for fuel budget oriented drivers. GM wants to do is show America that it can compete with the likes of Audi, BMW and Mercedes. 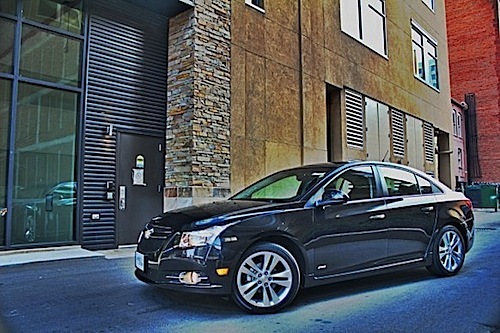 There are plenty of reasons to see how the Cruze 2.0 TD will convince many diesels are ready for the US. All concerned might be surprised at how well a Diesel fares in this economy and times. In 1981, I bought my wife a new Chevette diesel. This minimal car was powered by an great little Isuzu diesel, which had very good power even when fully loaded going up a hill, and would get over 60 MPG at cruise. There was very little noise with this unit, a little at cold start up and some under heavy load up a hill or under acceleration. At the time, Isuzu pick-ups and Chevy LUV's also had the diesel unit. Owners questioned, just loved them. Isuzu led diesel technology for many years, and many of the diesel units from all sources, use some or a lot of their technology. At the South pole, Isuzu equipment placed there in the mid thirties is still in use today. I suspect the new Cruze diesel is an Isuzu unit, or patterned after one. I think the new diesel Cruze will find plenty of buyers. I agree, this diesel as Jim said was either going to convince those who remember the yesteryear's ancient diesel or seduce those who are used to the European brand but don't want to pay as much. Chevy might have a winner there. I am glad to see the combined is 44 and not the highway. I have been waiting a long time for this to come out to replace my goold ole 2003 vibe. 56 is a buyer. Hope they have some incentives to lower that 25.5k price tag. Many options are being forced on us to buy this that many dont need. i.e. leather seats. Yes, it sounds as if Chevy is out for a vengeance there and have a nice turbo diesel to offer here.